I’m Adam and I’m thrilled to be asked by Technasma to do a guest post. As bit of an introduction to me; I’ve been in the hobby for nearly 16 years now, and I’ve collected a few armies in my time. 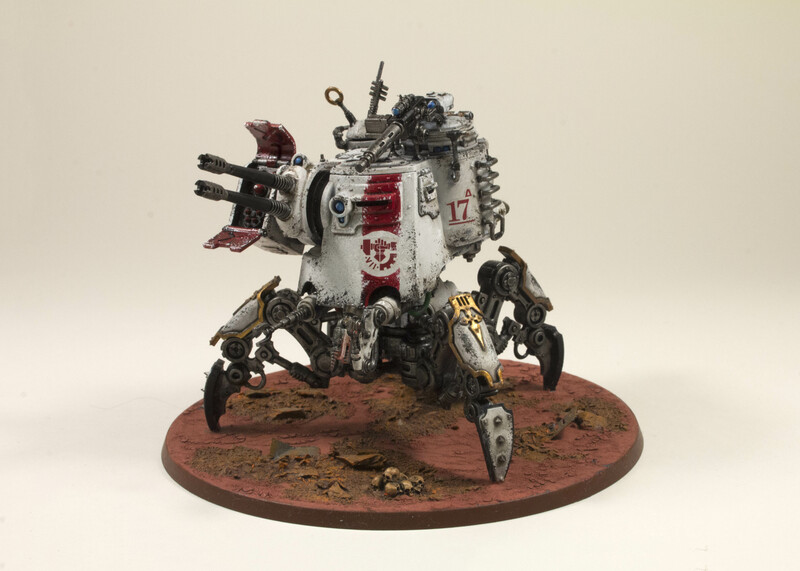 In this post I wanted to talk about my latest force – the Adeptus Mechanicus! I’d been hoping to see these guys as a full on faction for a long time, so when they finally came out earlier this year there was no way I could resist. After a bit of deliberation I settled on Metallica as my Forgeworld of choice, for two reasons. One, because the colour scheme looks really cool (always a key consideration! ), and two, because white will lend itself really well to being chipped, weathered and generally beaten up. Every time I start a new army, I always like to try and push my painting forward by trying some new techniques – this time round it was getting to grips with weathering vehicles, inspired by more than a few visits to Nottingham and seeing some of the amazing stuff Forgeworld have been putting out. When I put together an army, I tend to have a rough list in mind, but I buy whatever from it I most feel like painting at the time. I also force myself to only buy a new unit when I’ve finished painting the current one – the only downside to this is my armies tend to grow very slowly as result! 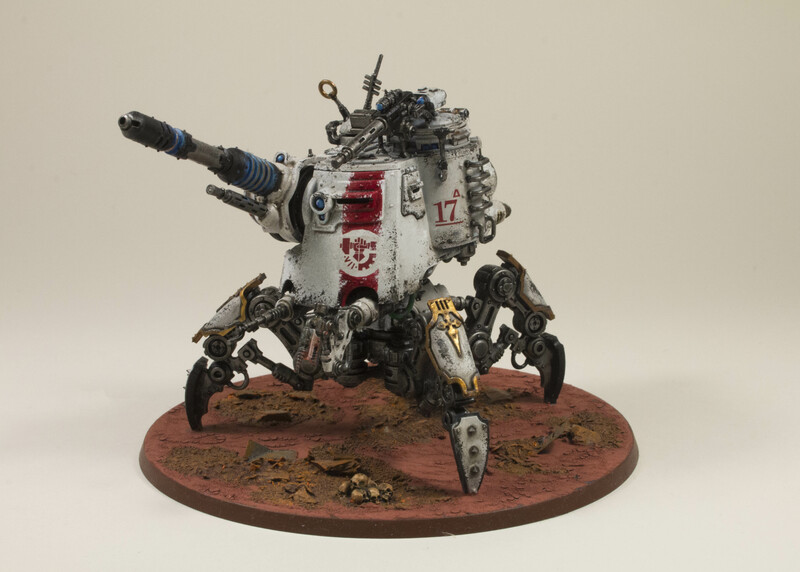 So far it consists of a squad of Vanguard, some Kataphron Destroyers and a Dunecrawler. 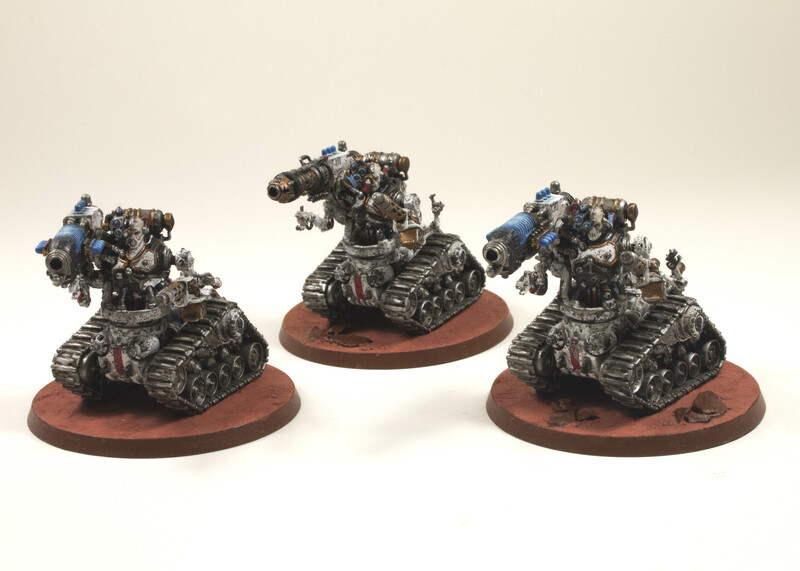 I wanted some flexibility with how I field this, so I decided to magnetise the weapons so I could chop and change which was fiddly but worth it! The Duncrawler was a lot of fun to paint. I decided early on I didn’t want to use the off white colour that GW paint their Metallica models with, instead opting for a battered pure white more in line with how Forgeworld paint their Horus Heresy World Eaters. 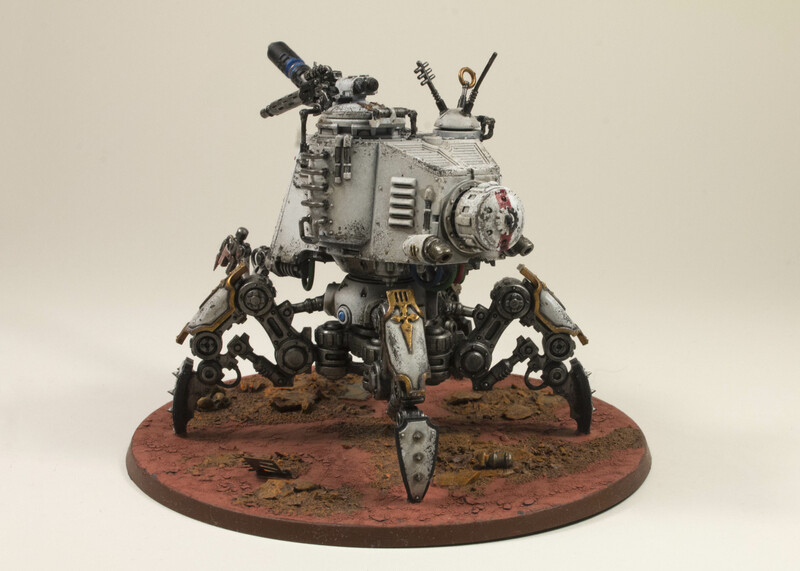 It was pretty simply to achieve – a base of Ceramine White, followed by an ink wash of equal parts Nuln Oil, Agrax Earthsade, Lahmian Medium and water. Once that was dry I sponged layers of Ceramite White back over the raised areas to build up a nice dirty effect. The weathering I’ve done so far has been achieved by sponging on layers of Abaddon Black and Leadbelcher. 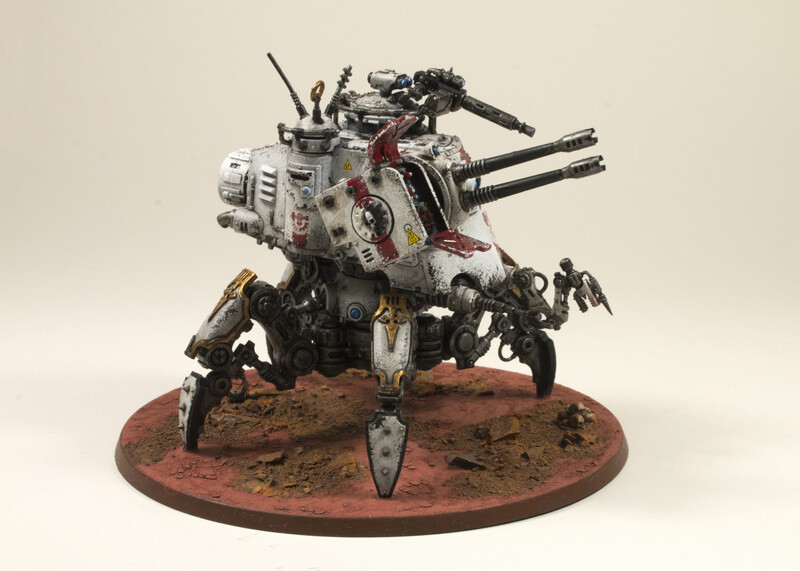 I’m going to be adding some Forgeworld weathering powders to this one next, once I get hold of some! 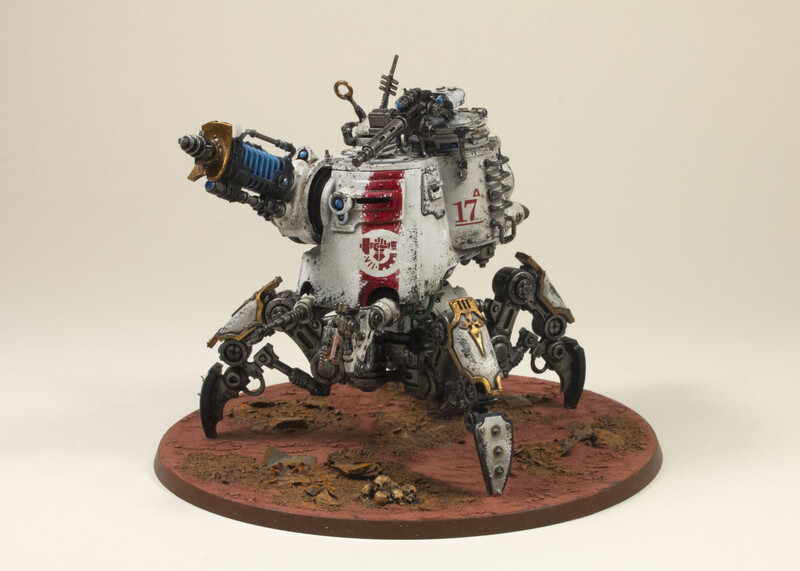 This entry was posted in Armies on Parade, Guest Post, Showcase and tagged #warmongers, 40K, Adam, Adeptus Mechanicus, Guest Post, Kataphron Destroyers, Onager Dune Crawler, Skitarii, Technasma, Warhammer 40000. Bookmark the permalink. 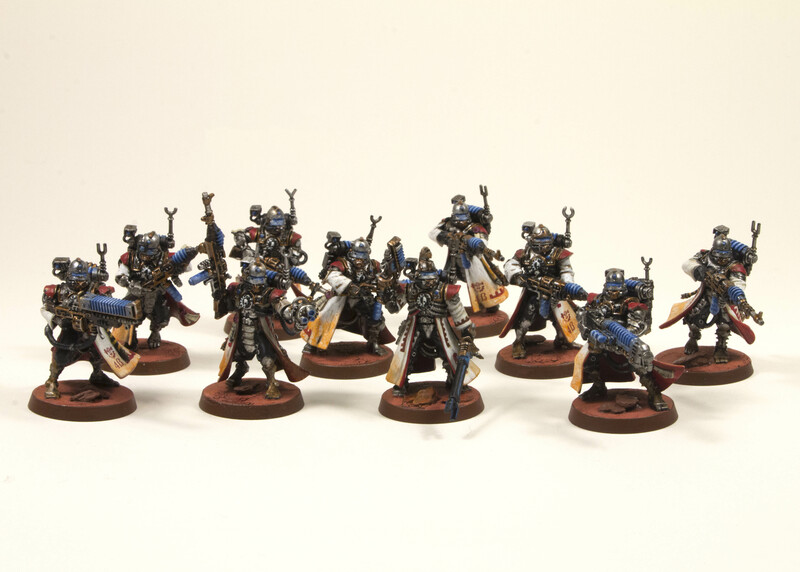 Brilliant models and paint jobs. Did you base coat in white?